Not an eye remained dry the moment the Bar Mitzvah boy donned his tefillin after being rescued from an Arab village. A moving event took place Monday at the Western Wall plaza in Jerusalem, when to the sound of excited singing, a young man accepted the yoke of Torah and mitzvot, becoming a Jewish man. Not an eye remained dry among the family members and the Yad L'Achim anti-assimilation activists present as the Bar Mitzvah boy donned tefillin (phylacteries) that the organization purchased for him. Some present at the event who were not aware of the bar mitzvah boy's secret could not have imagined that the boy who just got his Aliyah to the Torah, said the blessings and read the verses like an expert, grew up in his past as a Muslim child. The story began 15 years ago, when S., a Jewish girl from Jerusalem, met an Arab who exploited her naiveté and personal distress. Shortly afterwards, the two married and moved to an Arab village. Only after suffering severe domestic abuse that almost led to her death did S. turn to the anti-assimilation group Yad L'Achim and ask for help from the organization. A social worker of the Yad L'Achim rescue department was assigned care of S. and her son, and maintained telephone contact with her, with the conversations being conducted cautiously while the Arab husband went to work. In a complex operation, the organization rescued S. and her son from the heart of a hostile Arab village in Samaria and transferred them to a well-guarded and well-appointed hiding place. Under the guidance of Yad L'Achim's legal advisors, S. filed a complaint with the police about her Arab husband's violence, and when her husband was brought to trial and imprisoned for a protracted period, the Jewish mother received exclusive custody of her son. Over the years, S. came close to Judaism and her son, accompanied by a special Yad L'Achim mentor, began studying in the Talmud Torah school in the city where they lived. For the past year the tutor taught the boy the laws of putting on tefillin, reading the Torah, and preparing for the great day - the Bar Mitzvah day. 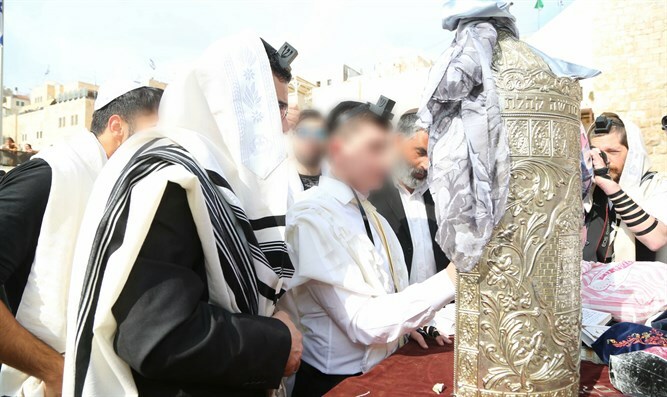 This week, the Bar Mitzvah was celebrated as it opened with a gathering of the Bar Mitzvah boy and his extended family, together with Yad L'Achim activists at Jerusalem's Dung Gate. A band of drummers awaited them, with shofars and bongos in their hands to accompany them on their way to the Western Wall. The festive spectacle and joyous sounds drew the attention of the nearby crowd, with dozens of people - some of them tourists - joining the procession that entered the Western Wall plaza with songs, dancing, and one of the Yad L'Achim activists carrying the Bar Mitzvah boy on his shoulders. As planned in advance, the Western Wall Heritage Foundation representative, Rabbi Meir Israel Nahon, who assisted in directing the event, received the procession at the Wall Plaza. A few hours later, a bar mitzvah celebration was held in a hall in Ashkelon attended by family members, school friends, and Yad L'Achim survivors - the mother's friends who were familiar with the organization's activities in the Arab villages. Rabbi Moshe Cohen, one of the most prominent activists, gave a congratulatory speech, and at the end of his speech he gave the young man a gift in the form of a fancy mishnayot set - a gift from Yad L'Achim. At the end of the event, the mother and grandmother of the Bar Mitzvah boy approached Yad L'Achim and thanked them all their help, and especially for organizing and financing the Bar Mitzvah celebration, including purchasing a set of tefillin and a full wardrobe.